Bill Moss was born in 1923 in Detroit, Michigan, and showed his artistic talent at an early age. He studied art at the University of Michigan, the Layton School of Art, and the Cranbrook Academy of Art before getting a job as an artist for the Ford Times in 1949. In 1955 he designed the Pop-Tent, today widely credited with changing the world of camping. In 1960 he established his own design firm, C. William Moss Associates, in Ann Arbor, Michigan, and in 1975 he and Marilyn Moss co-founded Moss Tent Works in Camden, Maine, to design and produce innovative, high-performance camping tents, backyard and beach products, and architectural canopies. Bill left the company in 1983 and later worked as a painter and designer in Arizona until his death in 1994 at the age of 72. Rico Eastman, a dear friend and former employee at Moss Inc, died in Santa Fe, NM, on Dec. 21, 2012, at the age of 60. He had just completed two pieces for this book on Bill Moss. Rico’s work is held in several national and international private and public collections including the Albuquerque Convention Center. He was a visiting artist at many colleges, universities, and art centers across the United States. Rico was also an accomplished musician, performing in several bands in Maine. His unique style of complex guitar riffs, backing vocals and show-stopping humor were always a hit. Rico had many friends all over the world, touching many people with his intense intelligence, his uniqueness, his talent, his humor and wit, and with his unrelenting compassion. He cared for his friends as deeply as each friend cared for him. We miss him. 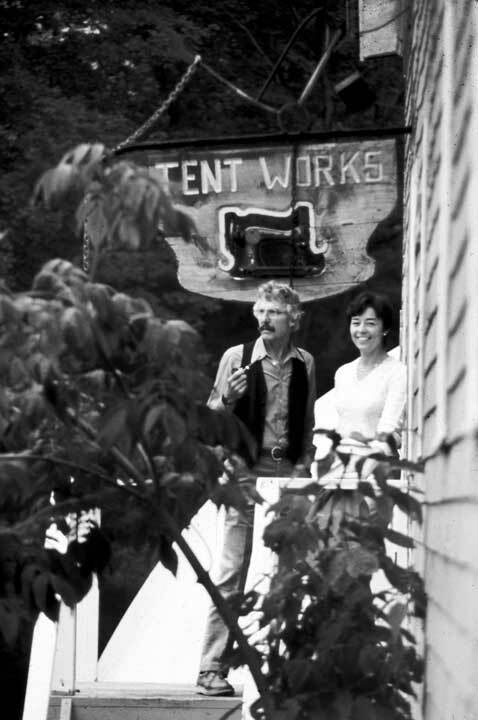 Marilyn and Bill Moss stand under the first company sign, "Tent Works," which included an old Singer sewing machine. Tent Works Ltd. was established in Camden, Maine in 1975. 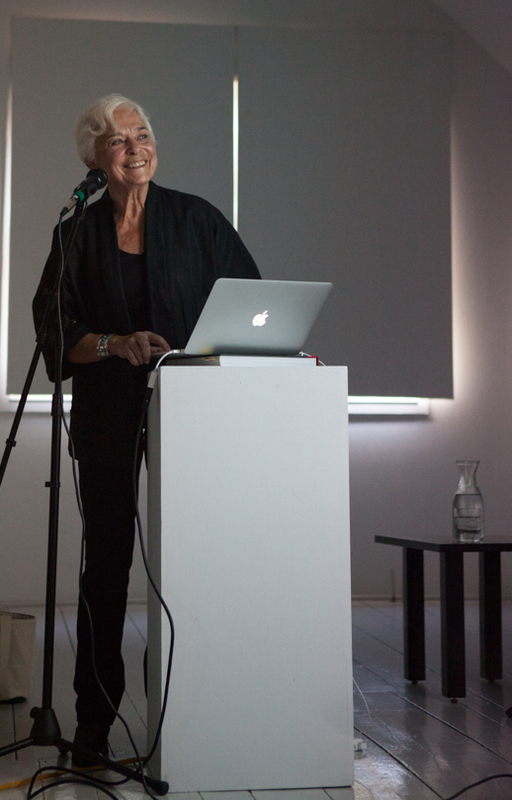 Marilyn Moss joined C. William Moss Associates in 1961 and in 1975 co-founded Moss Tent Works with Bill Moss. She went on to serve as president and CEO of Moss Inc and in the 1980s diversified the business by introducing tension fabric technology to the worldwide trade show industry. This experiment was so successful that the company eventually sold its tent division to REI and began focusing exclusively on trade show exhibits. Moss Inc grew to have 164 employees and revenues of $15 million, and in 2000 was sold in a successful equity investment transaction. After retiring from Moss Inc in 2001, Marilyn went on to earn a master’s of fine arts in writing from Spalding University in Louisville, Kentucky. Now a freelance writer, her article, “Along the Shore,” an essay on Cumberland Island, appeared in the Fall 2008 issue of the Louisville Record. In 2009, she traveled to Malawi to interview Joyce Banda, the country's former president, and later co-authored the article "Dancing with Democracy" about Banda that was published in the Spring 2013 Foreign Policy Institute’s journal, Orbis. Bill Moss: Fabric Artist & Designer was published in 2013, won a 2014 IPPY Independent Publishers Silver Medal and was a finalist in nonfiction for a Maine Writers & Publishers Alliance Literary Award. Marilyn's article, "Tents: Nomadic Architecture," was published in Espazio (February, 2014) and "Home as a Tent" appeared in the August issue of Maine Boats, Homes and Harbors. Marilyn is completing her memoir, From the Appalacchian Mountains to the Camden Hills.